If the gate is malfunctioning. If you have plenty of time to cross before the gate is fully lowered. If there is a shoulder to the right of the gate. 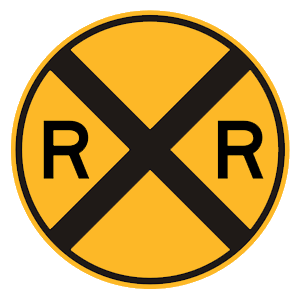 If gates are down at a railroad crossing, stay in place and do not try to cross the tracks until after the gates have been raised. It is against the law to drive around railroad crossing gates. The speed limit for school zones in Alaska is 20 mph. Always drive with caution where children are present. This sign indicates that the overpass ahead has a low clearance. 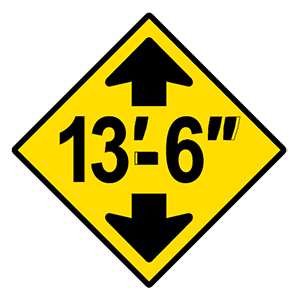 You should not proceed if your vehicle is taller than the height shown on the sign (in this case, 13 feet 6 inches). The driver on the right must yield to the driver on the left. The driver on the left must yield to the driver on the right. One driver should insist on the right-of-way. If two vehicles arrive to an unmarked intersection at the same time, the driver on the left must yield the right-of-way to the driver on the right. No driver should assume that they will be given the right-of-way. When following another vehicle under ideal driving conditions, you should maintain a minimum four-second following distance. Increase this following distance any time conditions are less than ideal.